[143 Pages Report] Polycarbonate Films Market size was USD 1.04 Billion in 2016 and is projected to reach USD 1.52 Billion by 2022, at a CAGR of 6.6% during the forecast period. In this study, 2016 has been considered as the base year and the forecast period considered is between 2017 and 2022 for estimating the polycarbonate films market size. This research study involves the extensive use of secondary sources, directories, and databases, such as Hoovers, Bloomberg, Businessweek, and Factiva, to identify and collect information useful for this technical, market-oriented, and commercial study of the polycarbonate films market. The primary sources are mainly industry experts from the core and related industries and preferred suppliers, manufacturers, distributors, service providers, and organizations related to different segments of the industry’s supply chain. The bottom-up approach has been used to estimate the size of polycarbonate films market on the basis of type, end-use industry, and region in terms of volume and value. The top-down approach has been implemented to validate the market size in terms of volume and value. With the data triangulation procedure and validation of data through primary interviews, the exact values of the overall parent market size and individual market sizes have been determined and confirmed in this study. 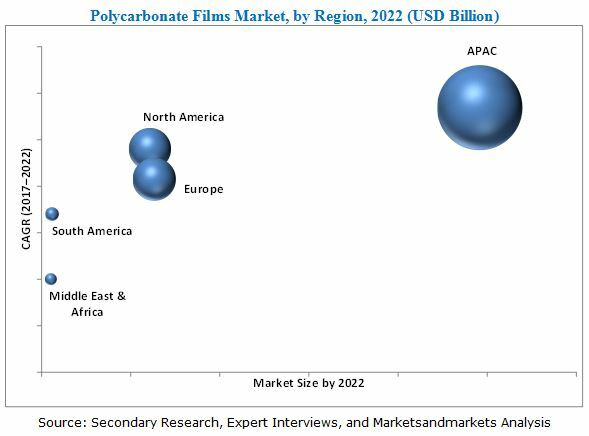 The polycarbonate films market is led by major players, such as SABIC (Saudi Arabia), Covestro (Germany), Teijin Limited (Japan), 3M Company (US), Suzhou Omay Optical Materials (China), and Mitsubishi Gas Chemical Company (Japan). These key players have adopted various organic and inorganic strategies to maintain their shares in the polycarbonate films market. This research report categorizes the polycarbonate films market on the basis of the type, end-use industry, and region. It forecasts revenue growth and analyzes the trends in each of the submarkets. These segments are further described in detail in the report. The value and volume forecasts for these segments have also been provided till 2022. The global polycarbonate films market is estimated at USD 1.10 Billion in 2017 and is projected to reach USD 1.52 Billion by 2022, at a CAGR of 6.6% between 2017 and 2022. The high demand for polycarbonate films from the electrical & electronics industry, especially in APAC, and the continuous expansions and new product developments undertaken by the major companies are the key factors driving the global polycarbonate films market. Optical polycarbonate films is projected to be the most dominant type of polycarbonate films between 2017 and 2022. They are widely preferred for the display and lighting applications in the electrical & electronics industry. Optical polycarbonate films are increasingly used in LCDs for consumer electronics as these films have superior optical properties. In addition, due to their excellent impact resistance, these films are also preferred for other applications such as overlays and automotive. Electrical & electronics is the largest end-use industry of polycarbonate films. This can be attributed to the growing number of consumer electronics which has resulted in an increased demand for polycarbonate films in it. Due to the superior properties of polycarbonate films, such as impact resistance, good thermal properties, optical clarity, and dimensional stability, these films are widely preferred in this end-use industry. APAC is the global forerunner in the polycarbonate films market, in terms of value and volume, and this trend is expected to continue till 2022. Countries in this region such as China, India, Japan, South Korea, Taiwan, Thailand, and Malaysia are witnessing significant increase in the use of polycarbonate films in industries such as electrical & electronics and transportation. The growth of the APAC polycarbonate films market is also attributed to the increasing urbanization and the growing population which is increasing the need for consumer electronics and automotive in the region. This, in turn, is boosting the consumption of polycarbonate films in the consumer electronics and automotive applications in this region. China is the fastest-growing market and this trend is estimated to continue till 2022. Though the polycarbonate films market is expected to witness rapid growth globally, the major restraint for this market is the setting up of a polycarbonate resins plant. Hence, the availability of polycarbonate resin is uncertain in every region. Therefore, various polycarbonate films manufacturers have shut their plants or reduced the production capacities. SABIC (Saudi Arabia), Covestro (Germany), Teijin Limited (Japan), 3M Company (US), Suzhou Omay Optical Materials (China), and Mitsubishi Gas Chemical Company, Inc. (Japan) are the leading players in the polycarbonate films market. These companies have adopted various organic and inorganic growth strategies, such as expansions, joint venture, and new product launches, to enhance their shares in the polycarbonate films market.